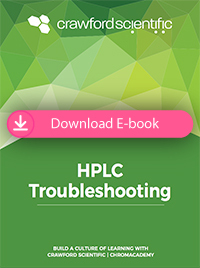 Our free, interactive ebooks cover a variety of challenges pertaining to HPLC, GC and LC-MS. If you need specific training, refer to our chromatography training page—we hope these ebooks can get you started. HPLC Mobile Phases: 10 bad habits to avoid in HPLC analysis. HPLC Column Maintenance: Prevention is better than a cure. Autosampler Contamination: Contamination in any chromatographic method is a complex problem to troubleshoot. This article will focus on autosampler contamination—how to determine if the autosampler is the source, and how to remedy the problem. Retention Time Variability in HPLC: I’m sure we have all experienced it—that sinking feeling when you realize your analyte retention times have drifted outside the software ‘window’ and you have a pile of chromatograms with no quantitative results. Troubleshooting HILIC: Covering insufficient retention, retention time drift and poor peak shapes. 5 Pictures Which Reveal Problems With Your GC Analysis – And How to Fix Them: A picture paints a thousand words. The art of GC troubleshooting often lies in being able to recognise a problem from the evidence presented in the chromatogram or baseline appearance. GC Column Maintenance: Prevention is better than a cure. Using proper procedures for capillary GC column storage and conditioning can have a major impact on column lifetime and the quality of results obtained. Solvent Choice for GC Injection: A critical method variable. I guess we all have our ‘go to’ solvents for our work in GC, and most of the time this will be based on the availability of the solvent and the chemical nature of our samples. GC Inlet Maintenance... have you really heard it all before? Many troubleshooting investigations in chromatography often don’t lead to a single causal factor. Often, the reason for problems or lack of method robustness are related to many small ‘contributory factors’. This is particularly true of the problems associated with sample introduction in capillary gas chromatography. New to LC-MS? 10 practical tips that will make a real difference. 10 ’Must Knows’ for Electrospray Ionisation. Get to grips with ESI: covering eluent pH, voltages, the Taylor cone, droplet desolvation and more. My LC-MS isn’t behaving! How do I address? Instrument manufacturers try to convince us that mass spec is just another detector. 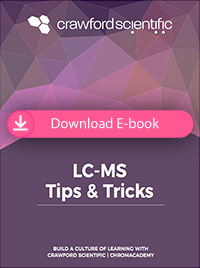 Most of us who work with LC-MS know that’s simply not the case—they can be maintenance intensive, unforgiving and generate complex information. 10(ish) Ways to Prevent LC-MS Contamination. Contamination is a common problem, prevention is the best cure. Controlling Na and K Adducts in LC-MS. Adduct ions are prevalent in LC-MS analyses and can come from any number of sources.